'Hot Topic' (Keith Keppel, R. 2002). Seedling #98-70B. lB, height 27" (69 cm), Early Mid bloomseason. Standards kazak brown (M&P 7-L-9), dandelion (9-L-4) base; style arms dandelion; falls darker kazak to brazil brown (8-L-8), intense dark dandelion heart, faint dandelion edge; beards darker than deep chrome yellow (9-L-7). 'Fancy Woman' X 'Brash'. Keppel 2003. 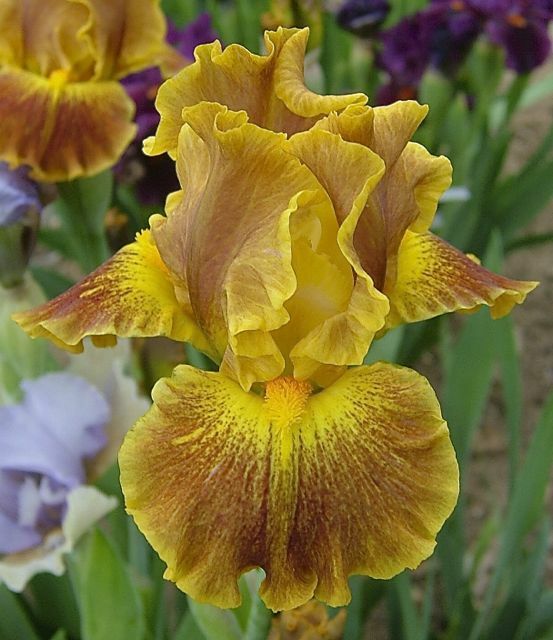 From AIS Bulletin #328 January 2003 Introducing HOT TOPIC EM 27" (Domaine sib) Luminata: rose-brown, with intense dandelion yellow heart, solid yellow orange beards. #98-70B. $20.00. Keith Keppel. jpg IMG_2885-X2_hot_topic.jpg manage 132 K 19 Feb 2016 - 20:55 BrockHeilman Please contact Brock Heilman for image use.